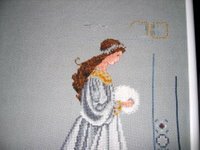 Here is Celtic Winter, I added the backstich on her face this evening. And then I picked up Woodland Fairy. 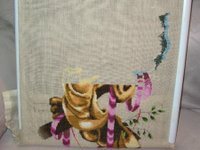 I think I am going to alternate between the plain DMC and the sparkly Kreinik so there is always something fun to do. 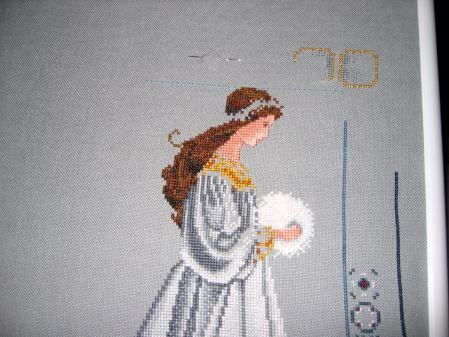 I am not sure that you can see what I did on the left side of her skirt (by her knee) this evening. It is a very pale yellow and gets washed out with the flash. 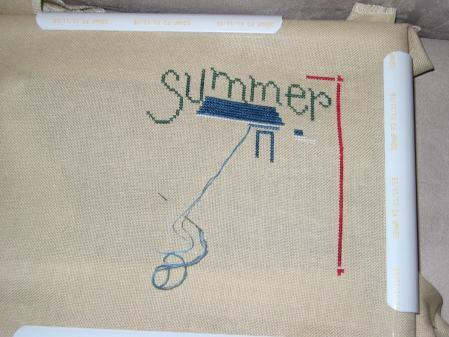 And then while watching CSI: Miami(Boy d o I hate Horatio Cane), I stitched on my RR. Now it is time to relax before bed…g’nite!! Too cool! 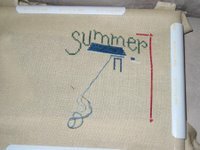 The Summer Sampler you’re working on for your RR is the same set I’ll be using for mine! There are four of us in the group, so I’m working on the first square before it starts rotating! Yayyy! It is great to see CW’s face!! I love your RR choice! I continue to enjoy your progress photos! Isn’t it nice to have stuff to rotate?